This website is taking over from the Hankelow Information Website which has been provided for so long by Charlie Foster. All the content up to April 2019 has been collected and compiled by Charlie. Many thanks are due to him for all his work over the years. I hope I can provide as good a service! Wednesday 17th April at 11.30 a.m. - Wednesday Lunch Club in the Community Room of Hankelow Methodist Church. Thursday 18th April at 7.30 p.m - Audlem History Society meeting in the Scout and Guide Hall. Speaker: Dr. Diana Leitch on "Fletcher Moss and His Travels in Cheshire and Shropshire". Saturday 20th April at 10:00 a.m. - An open morning at the White Lion. More details can be found here and at the White Lion website. 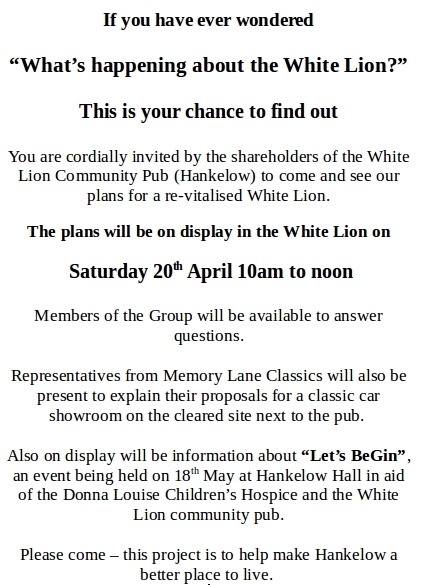 Come and see the plans for the revitalised White Lion. Monday 22nd April at 9.50 a.m. - The Mobile Library will be available on Hankelow Green between 9.50 a.m. and 10.35 a.m.
Wednesday 24th April at 11.30 a.m. - Wednesday Lunch Club in the Community Room of Hankelow Methodist Church. 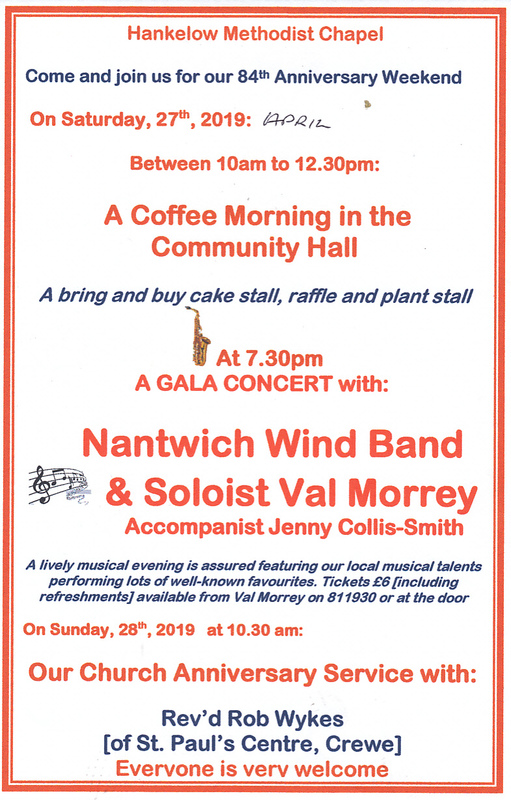 Saturday 27th April at 10 a.m. - A coffee morning in the Community Room of Hankelow Methodist Church. Click here for further details. Saturday 27th April at 7.30 p.m. - A concert in Hankelow Methodist Church to celebrate our 84th anniversary. Click here for further details. Sunday 28th April at 10.30 a.m. - An 84th Anniversary service in Hankelow Methodist Church. Click here for further details. Monday 29th April at 7.30 p.m. - Hankelow Amenities Group meeting in the Community Room of Hankelow Methodist Church. Thursday 2nd May from 7 a.m. to 10 p.m. - Polling day for elections to Hankelow Parish Council and to Cheshire East Borough Council. 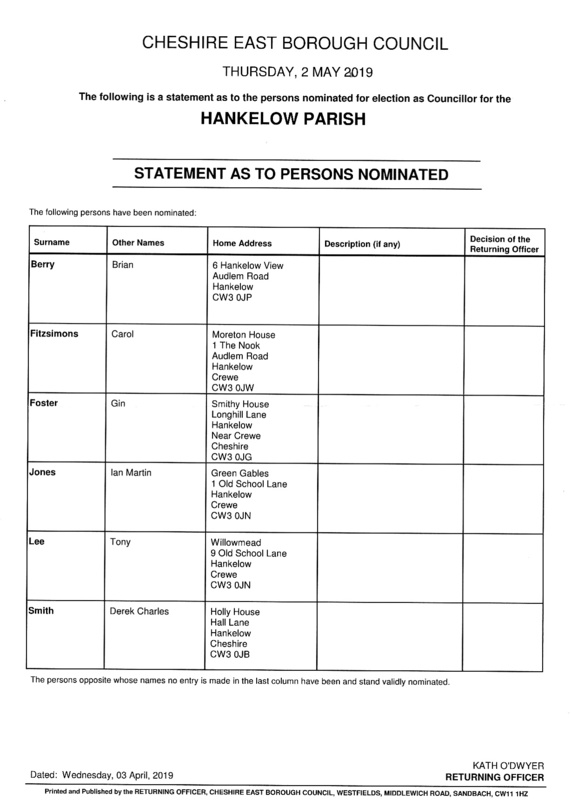 The candidates for election to Hankelow Parish Council can be found here. Voting arrangements can be found here. Monday 7th May at 7.30 p.m. - Parish Council Annual General Meeting in the Community Room of Hankelow Methodist Church. Please note that the Parish Council's Annual Genereral Meeting is preceded by the Annual Parish Meeting. This is an opportunity for members of the community to make their voices heard. Please note the change of usual day. Saturday 11th May at 8.15 a.m. - A breakfast meeting of the Christian Men's group "Second Helpings". What's going on with the White Lion? Things are about to start stirring at the White Lion! More details can be found at the White Lion website. Tom Hassall was recently on television again - here's a link to an article on the Audlem website. Edith Brough of the Hulme family recently celebrated her 100th birthday - here's a link an article on the Nantwich News website. 13th April - New event information has been added to the Village Events page. 11th April (1st of 3) - Information about our citizens standing for election to Hankelow Parish Council, and information about voting arrangements. 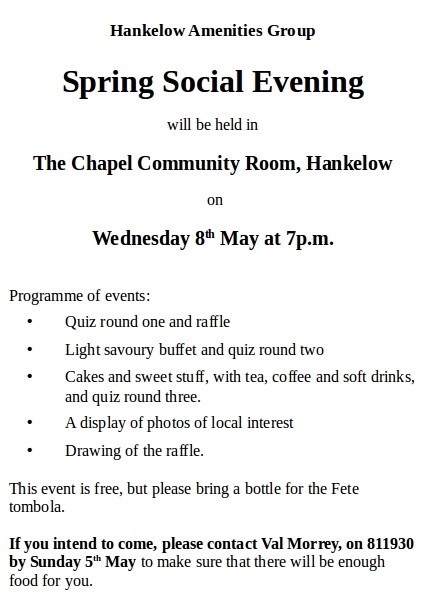 11th April (2nd of 3) - Details of the varied program of events to celebrate the 84th Anniversary of Hankelow Methodist Church. 11th April (3rd of 3) - Three new recommended traders have been added to the "Services" page, a Landscaper , a provider of Garden Buildings and a Tree Surgeon. 26th March - New photograph in the historic photographs section of the MediaGallery, showing an aerial view of Hankelow village centre looking east around 1990.